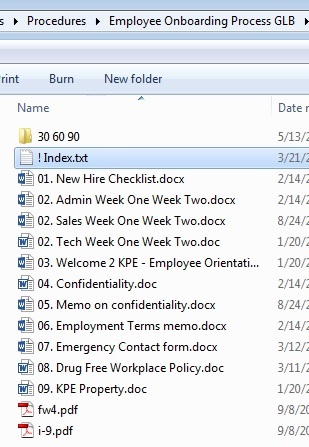 "One more thing Important I've found a lot of SMB's fail at is People will name PATHS and items TOO long for their Third Party Backups to handle and the document doesn't get backed up 260 Characters is a Limit in Windows but Check what Backup Tools you are using! http://msdn.microsoft.com/en-us/library/windows/desktop/aa365247(v=vs.85).aspx"
I'll offer a different view that says you shouldn't be restricting yourself to a file name to provide meta data. Our SOPs are stored in a full text searchable structured wiki. By structured, I mean that you can have search tags associated with each wiki page and enforce a structure to pages where needed. By using a wiki instead of a filesystem, or even a Sharepoint library, we can find SOPs, Tech Notes, etc by a similar process to using Google. If you want to maintain a wiki, that's a good approach. But when you get a list of articles, you'r still going to want them to have good, descriptive titles. The computer might be able to scan all the text inside the document, but the human who need to click on something will still make best use of the title.